Master Gardener Seed Starting Tips: Save Money on Pricey Greens, Herbs, and Veggies. Grow Your Own. It's that seed-starting time again! Gardening is in my blood as much as creativity and frugality. (Thrift Core's 2009 posts were nearly exclusively about gardening!) I'm in school learning all about how to heal with plants. My mom's mom grew all of her food like her mother before her. Mom cultivated an award-winning garden and I spent my childhood in a garden center she managed, watering the plants and stopping to smell each one along the way like a human butterfly. It's easy to start your own plants. I've shared a little on seed-starting before but today I'm compelled to share what I've learned from a master gardening course. 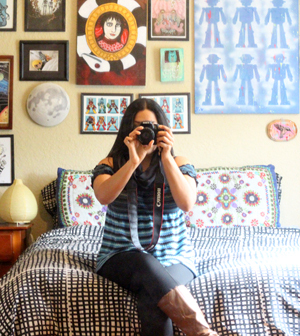 I'll be trying these methods out this year, I'd love to know if they work for you, too. Why to Grow? : You will save money on expensive plant-food and avoid harmful chemicals. Having greenery in your life and the gardening hobby is de-stressing and mood boosting. Fresh plants last longer, too. Seeds: Avoid hybrid (sterile, artificial) seeds, go organic. I love to try heirloom varieties, seeds with natural variety through cross-breeding that have been passed down in families from centuries. 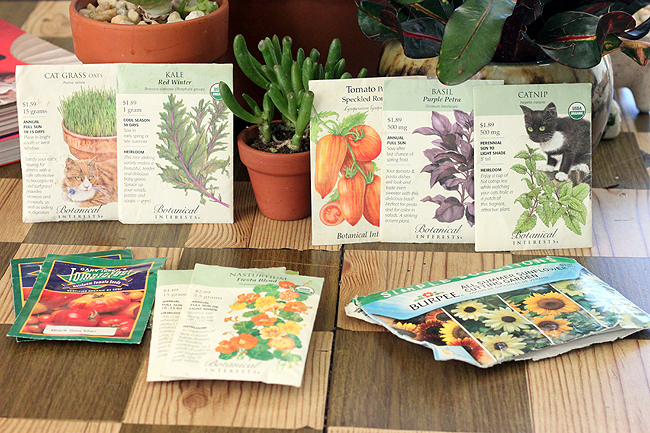 Consider local and online seed-swaps. Storage: Like Highlander characters or the obnoxious longevity of your least favorite pop act, your seeds are IMMORTAL! We've grown seeds found in Egyptian tombs. The trick is to keep them bone dry. Cooling them will put them in "hibernation" mode. Store seeds in a plastic container in your fridge. Add a bowl of dry milk or a moisture-removing gel pack to the container to wick away moisture. Growing Medium: The best seed starting mix is one part of each of the following: (1) sphagnum moss or coir (acidic), (2) vermiculite (heated mica rocks, looks like tiny balls of old paper, neutral PH), and (3) perlite (crushed lava, heated until it "pops" into white "kernels", you see it in most potting soil, it looks like Styrofoam. Nuetral PH). You can buy an organic already started mix or mix your own. Sanitize: Make sure to wash your seed-starting containers with warm water and hydrogen peroxide mix (a splash of peroxide will do) or natural castile soap (like Dr. Bronner's) mixture. 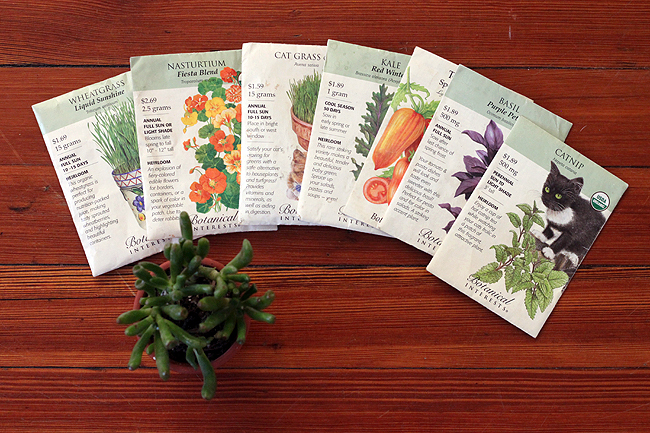 Timing: The back of your seed pack will tell you when your plant will be ready to go outdoors. Look up your area's calculated last frost. Start your seed a few weeks back accordingly. For example, sunflowers and cucumbers need 3-4 weeks before going into the garden, some veggies like celery need a full 12 weeks. Let's Get Plantin': Moisten your seed starting mix until its damp, but not soaking. To promote growth, use warm (never steaming!) water right before placing the seeds in. 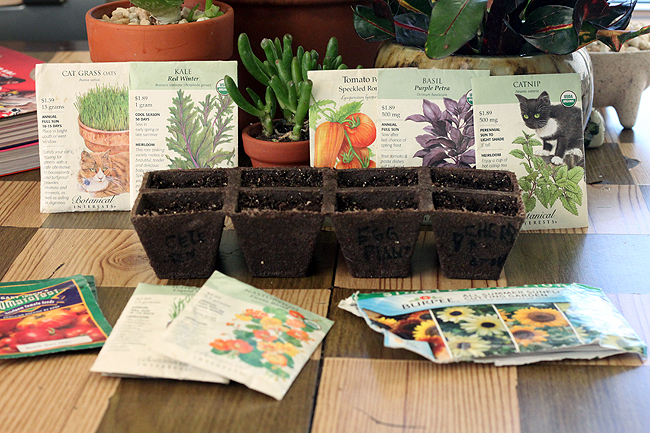 Fill your containers and follow the seed packets instructions for planting depth. I'm trying a new method this year, putting the seeds in the hole without covering them back up! It's a master gardener trick that sounds counterintuitive but is said to speed up germination time. Temp: Keep your seeds warm to help speed up growing and germination. A grow-light set-up is preferable but for those of us that can't do this, put your seedlings in a warm sunny window, atop the warm fridge or outside in the garden if it's not too cold in your area. Watering: Water when the soil is dry again, the soil should be moist, never soggy. If you have chlorine in your tap water leave the lid off a jar or bucket of water overnight and it will evaporate. Using a turkey baster is an inexpensive, precise way to water seedlings. Easier Watering: A more fool-proof way to water (it's easy to drown the seeds!) is to place the whole container is a shallow pan of water and let the dirt soak up the water. Remove when the top of the soil is moist. I'll follow-up in the future with transplanting and more detailed gardening tips, like keeping pests away from your precious plant-children! Get thee to a garden center, I challenge you to at least try planting one frequently-used vegetable, herb, or green. (A good way to go for a beginner.) If you're new to this, new experiences keep you sharp. If you're a veteran plant killer, know that every single gardener has killed a plant. Or two. Or twenty. That's Nature. It's completely unpredictable, yet incredibly rewarding. There's nothing like picking your own fresh herbs and veggies to use. I'm excited to make healing products for my line and my friends/family with home-grown herbs. Growing anything this year? Did I leave anything out? I went back and deleted some of the details to save for future posts. Too much data-dump! Of course if you have any questions now or along the way, leave 'em in the comments and I'll have the answer for you. Great tips! Growing from seeds has always seemed so intimidating to me. Your post is informative and encouraging. I hope it helps. Please ask any questions you may have along the way, it's really pretty easy. It saves money and opens your planting possibilities. And it's nice to control your plant from the very start. :) Future posts will have more helpful photos/diagrams too. I need to grow some tomatoes this year. I tried radishes last year but they just were woody and inedible. I grew cilantro which is almost used daily at our house successfully for the first time. All the times before were containers, this time I put it in a flower bed which it seemed to like way more. I have to wait a month or two before starting the seeds though. Radishes can get woody quickly, especially in the heat. They're one of those weird ones that are super easy or impossible, at least they're cheap to buy :P Tomatoes are my fav, they are tricky to grow but I'm excited to work hard on it this year! Cilantro is a favorite of mine, takes Mexican and South East Asian food to the next level. I love to garden! I've always lived in the Midwest, so as soon as Spring hits, we're always out in the yard planting. I've never thought about container gardening though. I may have to give that a try! I have a huge passionflower vine and would like to make a tea with other herbs but cannot find a good recipe on the Internet .maybe you know a good combination to make a healthy good tasting tea blend. Tomatoes are top of the list for us this year. We had a good garden last year, except the tomatoes were ruined! My kids can seriously eat about a pint of tomatoes a day---they eat cherry tomatoes like grapes. I can't afford to buy that many! I adore tomatoes and wish I made the type of money to buy that many, too ;) Fresh fruit is crazy expensive! I'm trying them again this year, too. The last time I was growing a lot of them a Florida flood killed them.